Meet Sarah! Our acne transformation of 2015! Here’s what Sarah’s skin looked like back in August. Sarah came to us about 2.5 months ago frustrated with her acne. Something we really love doing here within the Esthetics department here at Capitol is working on acne clients. Nothing is more exciting than a client walking in and seeing a noticeable improvement with their skin. Have acne? We can help! We asked a few things from Sarah when she signed up for our case study program. Use our skincare, and only our skincare. Use the products only as instructed. Be excited for awesome results. Now, as I stated earlier, we’ve only been working on Sarah’s skin for about 2.5 months. Wondering what we did in that short amount of time? You’ll be surprised to hear that it wasn’t anything aggressive. For five weeks we had her come in for weekly customized facials. We mixed and matched our Image Skincare products to best suit what was going on with her skin each week. We did put her on some of our Clear Cell Acne products which can be a bit drying. We combated the dryness with hydrating products without breaking out her skin. Say what? If you have oily or acne skin, you still need hydration. Most clients claim that they don’t wear moisturizers because it makes them feel oilier. You need to break up with your moisturizer if this is the case. It’s them, not you. The key to finding a great moisturizer that works for your skin TYPE is having a professional assist in the selection! We’re here to help with that. Not all moisturizers are created equal, and there are plenty of moisturizers in the sea. No moisturizer’s feelings were hurt in the making of this blog post. Got it? Good. So, back to Sarah. 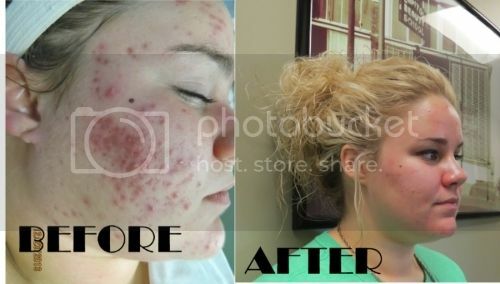 We’re thrilled with this before and after of Sarah and we’re really excited to have the acne under control. We will be shifting our focus with products and services to target the pigmentation that the acne has left behind. Stay tuned! Jindilli. Jiiiiindillllli. That’s a fun name! Have you walked past our retail shelves in the past few months wondering “what are those beautiful bottles over there all about”? Well my friends, Jindilli just happens to be our NEW exclusive body spa line! Enriched with pure macadamia oil, these products are simply d.e.v.i.n.e. Having a fun time saying Jindilli out loud? Unique name, but what does Jindilli mean exactly? Jinidilli is actually a word used by Australians for macadamia. You learn something new everyday! This beautiful company prides itself with it’s family owned macadamia farms close to the Australian surf breaks near Byron Bay. With highly concentrated amounts of pure macadamia oil, Jindilli is sure to please. Their luxurious line includes products for treatments as well as at home retail products. Allow us to pamper your skin with one of our famous body wraps or treatments and you can continue to pamper yourself at home! Morgan & Cherie from Jindilli visiting Capitol! So what’s all the hype about? Why is [macadamia oil] better than other oils I’ve used? As we age, our natural sebum (oil) production slows down. The less natural oil our body is providing for itself, the drier our skin gets. The drier our skin gets, the older it looks. It begins to thin, droop, and just look down right sad. Keeping your skin properly exfoliated and hydrated is an essential key to keeping youthful looking skin. So how do I use Jindilli? Can I try it? Of course you can. Capitol offers a variety of services that include our exclusive Jindilli products. From manicures and pedicures, to full body scrubs and back/body treatments, Jindilli is sure to delight in your skin. This entry was posted in Esthetics and tagged AUSTRALIA, BODY TREATMENT, Capitol School Omaha, CHEAP MANICURE OMAHA, Cheap Pedicure Omaha, ESTHETIC SCHOOL, esthetics, ESTHETICS OMAHA, ESTI, JINDILLI, MACADAMIA OIL, SKIN CARE on August 8, 2015 by Airiel Bailey. Illuminate Your Skin with Iluma! Tried any of the products from Image SkinCare’s Iluma line? If you haven’t…. I highly suggest you stop whatever it is that you’re doing (which I’m assuming is reading this blog… in that case, finish reading this blog and then stop what you’re doing!) and head over to Capitol to pick up our favorite skin care products. Iluma you say? What’s this you say? Iluma was created to lighten, brighten, and illuminate the skin. Use the entire line or mix and match with other Image products to get the ultimate results you want for your skin. A lightening cleanser, lightening and bleaching serums, intense brightening crème, a lightening hand lotion, and an intense lightening body lotion were just the beginning! In March, Image launched three new fabulous products, two of which, are included in the Iluma family. Welcome Iluma Intense Brightening Eye Crème, and while I don’t say this often, this is on my top 5 list for Image. Want to know another item on my top 5? The Intense Brightening Exfoliator Powder is AHHH-MAZING. Gentle enough to use daily, this micro exfoliating power smells like lemon sugar cookies, and gives my skin instant results. Mix with ANY of the Image cleansers for a mini exfoliation, use it alone for a gentle cleanse, use it on a dampened finger on the lips as a lip buff… the options are endless! These two products have sold out four times since they’ve been launched in March! Stop in and ask us which Iluma products are right for you… you’ll love how your skin glows! This entry was posted in Uncategorized and tagged esthetics on June 4, 2015 by Airiel Bailey. If you’re venturing outside on these lovely spring days we’ve been having, chances are you’re exposing yourself to the sun and all of it’s wrath. That’s right, I said wrath. While we love the sun, and just can’t seem to soak up enough of it after a long Nebraska winter, that darn thing is STRONG. Did you know that it takes only minutes in the sun before your skin starts to burn, pigment, and age? Did you know that sun damage is happening to you even while you’re driving to school or work? Practice safe sun with IMAGE Skincare’s Prevention +! It’s as easy as applying one of our five amazing sunscreens! Now, I know what you’re thinking. “I hate sunscreen!” I used to feel the same way being an ex-sun goddess myself! Why are IMAGE’s sunscreens any different you ask? We’ve got choices my friends, and boy are they all so- nice! Enjoy a relaxing facial with your sweetheart this Valentine’s Day here at Capitol! This entry was posted in Uncategorized on January 30, 2015 by Airiel Bailey. She’s got 99 problems, but a zit ain’t one! You might of followed along with our journey with Kendall that started back in December of 2013. You probably saw our amazing before and after of her skin, and if you didn’t you can certainly check it out below! One less, one less problemmmm. So maybe you read all about Kendall, but have you met Lily? Lily, one of our recent Cosmetology graduates, came down to see us on a regular basis frustrated with her inconsistent breakouts. A milder case of acne than Kendall’s, Lily’s skin still bothered her, and so the journey began. Don’t pick at the breakouts! An aggressive facial to treat and beat break outs and acne. This facial targets breakouts, while encouraging the skin to purge out any of that bacteria in the skin. Exfoliation and pigment fading qualities allow us to target pigmentation, scarring, and uneven texture. Masking allows us to hydrate and exfoliate your skin while softening up impactions making manual extractions and removal of blackheads that much more comfortable for the client. While we performed multiple peels on Lily, our main goals were to target the breakouts, oiliness of the skin, texture, and pigmentation from scarring. Chemical peels were scheduled out 2-4 weeks apart to ensure her skin had plenty of healing time between. The peels we targeted Lily’s skin with were IMAGE’s Lightening Lift, Acne Lift, and one of our Perfection Peels to cause actual peeling of the skin. Lily stopped down every couple of days to allow us to manually remove any large breakouts or blackheads. Estheticians are trained to remove impurities with techniques to help prevent the spread of bacteria and scarring of the skin. High Frequency can be performed on extractions to help kill bacteria and to drive acne clearing products deeper into the skin. We know having acne and constant break outs is frustrating and sometimes just down right sad. We understand that scarring and embarrassing breakouts can make you feel like you never want to leave the house with less than five applications of foundation on. We’re here to help in any way we can. As professionals in the skin care industry our job is to educate our students and clients on which products and services are best suited for their skin type and what’s best to treat and target their main concerns. This entry was posted in Uncategorized on January 28, 2015 by Airiel Bailey. This treatment falls into a category all it’s own. It’s not a facial, it’s not a microderm, and it’s not even really a peel. So what is it and what do we do exactly? The O2 treatment allows us to brighten your skin and leave it glowing with each and every step! We start off by cleansing your skin with a brightening cleanser. Next we use a gommage-like enzymatic peel solution that we massage into the skin. While you’re enjoying your massage, we’re actually rolling off all of your dead skin! This step is followed by an oxygenating foam-like masque. Our final steps include soaking your skin with plant-derived stem cells to protect your skin against aging, and as always, we follow every treatment with an SPF! The O2 Lift is our most recommended treatment for brides and their bridal party. Who doesn’t want to glow on their big day?! The Earth’s oxygen has greatly decreased since pre-historic times! We can survive weeks without food, days without water, but only minutes without oxygen. This entry was posted in Uncategorized on October 28, 2014 by Airiel Bailey. Oh, hey there. Meet the Vinyls, Mirabella’s new 10 hour wear full coverage lipstick! Check out our makeup counters to see our twelve new colors! Who said Vinyls had to be a thing of the past? Lipstick isn’t your thing? Try Mirabella’s new Velvet Lip Pencils! Moisturizing lip pencils with intense, long-wearing color. The pencils come in six bold colors and contain Berryflux Vita Active to preserve lip suppleness, elasticity and tone. Increase color by layering or apply gloss to tone it down. There’s a perfect color for everyone, come try ’em today! This entry was posted in Uncategorized on May 20, 2014 by Airiel Bailey. Vinylux – Weekly Wear Polish, My Friends! Vinylux you say? What is this you say? Have you heard of Vinylux? If you haven’t, it’s time you did! CND’s Vinylux is great for those on the go, and it’s now here at Capitol! What’s so great about this new polish? Oh, I’m getting there! Custom Blended Skin Care Products. Do you beleive in magic? Our skin care line is well, pretty amazing. Custom blending our already amazing skin care = magic. Do you believe in magic? You should. Have doubts? Check out these facts. Studies show that Custom-Blended skin care may be up to 400% more effective than traditional off-the-shelf products. Yes, I said 400%, that’s no typo my friends! Products customized for your specific skin conditions offer visible, dramatic results. The product’s active ingredients are boosted specifically for your skin. You pay for quality ingredients, not fancy packaging and false promises. Custom blended products are mixed right here at your request, they don’t sit on the shelf and loose potency. Adding accelerators to our base products boosts active ingredients from 10% to 50% offering you fast and dramatic results. Curious as to how exactly we make this magic? Our staff and students consult with you over your main skin concerns and conditions, we then target them with our highly concentrated accelerators which we add to the base product of your choice. Only YourX has the ability to custom blend skin types 1-5. Cleansers, toners, gels, creams, masks, scrubs, eye creams, lip balms, and gel-creams! What can we target and treat? So glad you asked! This entry was posted in Uncategorized on May 6, 2014 by Airiel Bailey.